Horses, like people, change from day to day. For example, yesterday your horse might have been a placid animal when the weather was warm, but today it might be wild when a brisk breeze is blowing. For this reason, you must categorize your horse every time you ride. Each horse will fall into one of the following three basic categories: dull, normal, or quick. You can begin studying your horse’s type long before you work in the ring. For example, if a horse hangs its head low in a corner of the stall and props one hind foot up, then it would appear to be a dull horse; but if it walks around and around the stall, sticking its head out the door and whinnying every once in a while, then it would appear to be a quick horse. Similarly, if the horse stands completely still when being mounted and is reluctant to move forward from a firm squeeze of your legs, then it would seem to be a dull horse. But if it dances around while you are trying to mount and rushes off as you swing your leg over the saddle, then it would appear to be a quick horse. Finally, as you are walking the horse to the ring, if it plods along with its neck stretched down and out and requires a great deal of encouragement from your legs, then it would appear to be a dull horse. But if the horse carries its head high and looks quickly from one object to another, or jogs rather than walks, then it would seem to be a quick horse. Although you have not begun to work in the arena, you already have a good idea of what to expect and, using this knowledge, can avoid certain pitfalls. For example, when anticipating a dull horse, mentally prepare yourself to be assertive, so that you will be able to enliven the plodder on the flat and not wait until you are facing a course of jumps before you deal with its slowness. 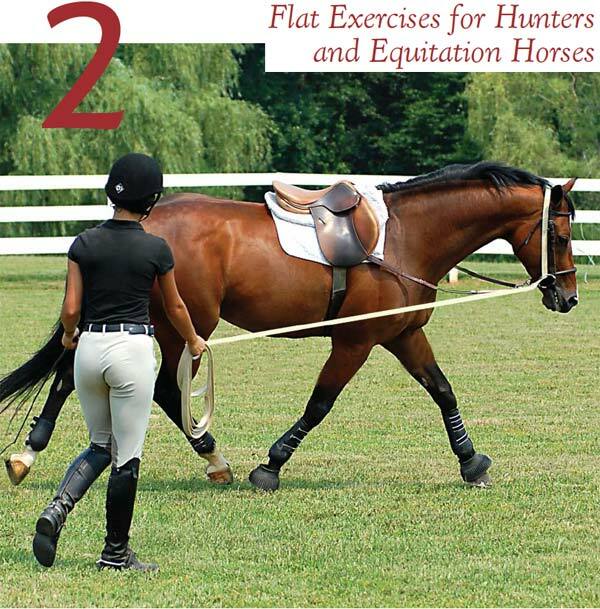 If you have mounted what seems to be a quick horse, you can anticipate that it will want to rush when working at all the gaits and will overreact to your aids. By remaining calm and applying your aids softly and slowly, you can encourage the horse to relax; but if the animal does not respond to your tactfully applied aids by settling down within a reasonable period of time, you can longe it to release its excess energy.